Gather some recycled items such as: paper towel rolls, bubble wrap, caps, corrugated cardboard, and plastic wrap... anything with texture, really. I used Speedball watersoluable inks for this but regular paint works great and a variety of paint types provide a multitude of outcomes. 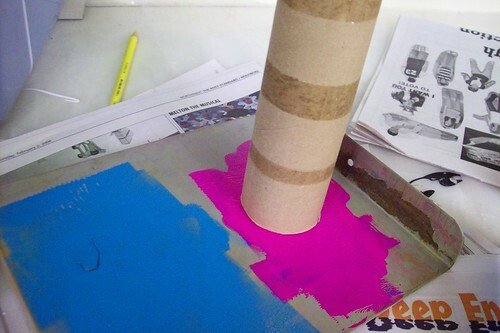 Squeeze some paint or ink onto an inking plate or other type of surface and use a brayer (or a paint brush OR your own fingers if you don't mind getting down and dirty!) 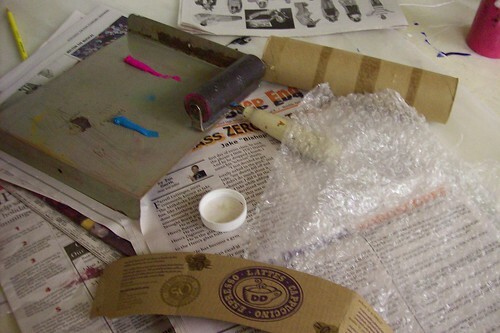 to spread the paint onto the item to be stamped. Press the item onto your paper or surface with a firm and even pressure... don't wait too long for the ink or paint to dry or it won't work. Repeat as needed or to create different distressed effects. 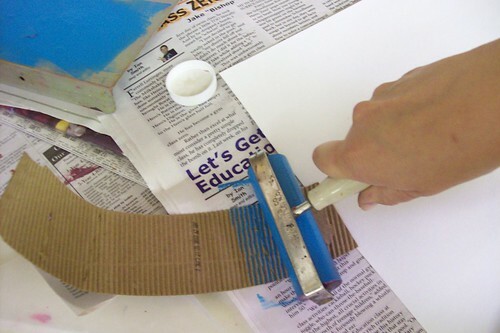 Another way to use items is to just dab them directly onto the paint or ink and stamp with them to create shapes. 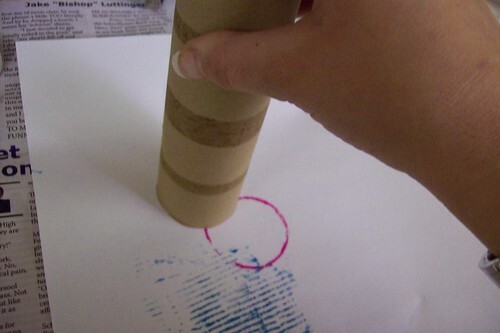 Like with this towel roll, I just dab and stamp to create circles. 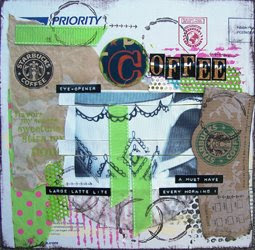 Here is a visual journal page that I did recently with my "green/recycled items". I used bubble wrap and left over packaging from an overlay to create the bird. Email me(mmatott@twcny.rr.com) your addy and I'll get that right out to you! thanks for the inspiration and the chance to win. I always have lots of Starbucks holders and love ways to use them. I LOVE the "Patience" and of course, the green/recycled things. It made me think how to use some stuff. You are brilliant, but of course I am not prejudiced!